I try to build a function generator (preferably a sine) with an R-2R ladder and a Arduino Leonardo by Borderless Electronics. For performance reasons one should use portd instead of digitalWrite. However the signal is not at all what I want (just noise). So upon further investigation I found that the digital pins were never on HIGH. Pin 6 worked flawlessly. Furthermore I have tested the two failing pins with simple test programms and they behaved exactly as I would have expected. I tested this with two Arduinos of the exactly same type. Question: Why are pins 5 and 7 never on HIGH? I test this by simply connecting an oscilloscope to the output pins. The behaviour is extremely strange since the pins seem to be in random order, some even missing to portd. Furthermore portd = B11111111, according to the manual, is equivalent to portd = 255; and should set all pins on HIGH. But in my case it sets every pin to HIGH, except pins 5 and 7 are on LOW. This is because on ATmega 32u4, which is used in Arduino Leonardo, pins 5 and 7 are not mapped to port D but to port C and E respectively, as you can see in the ATmega 32u4 - Arduino Pin Mapping. or split each sine[i] in 2 parts because you will have to work with 2 ports at the same time. As @jfpoilpret points out, Arduino pins are not always mapped to port bits in a straightforward manner, and it’s crucial to understand the mapping for your particular model. In fact, the Arduino Leonardo is designed in a way that none of the ports has all 8 bits usable as I/O pins. As far as the microcontroller is concerned, ports B and D each have all 8 bits available, but the Arduino Leonardo/Micro design uses one bit on each port for a LED. I would also recommend that if you’re using a PORTx register directly, instead of going through the Arduino API, that you also use the DDRx register to set pin directions, instead of trying to use pinMode. Not the answer you're looking for? Browse other questions tagged programming pins arduino-leonardo or ask your own question. 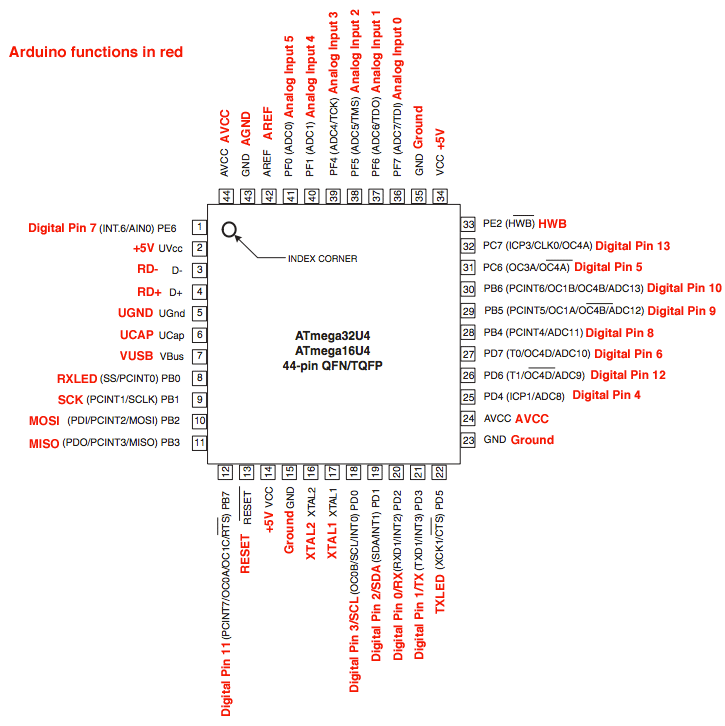 Where are the digital and analog pins for the adafruit atmega 32u4 breakout board? Can Digital/Analogue pins double as power supplies? Does a pin (input pin Arduino) still float when connected to GPIO on RPI?